Find resources to prepare for medical technician tests, with medical tech study guides, medical tech practice tests, courses and more. All medical tech positions have organizations that offer certification in their respective fields. 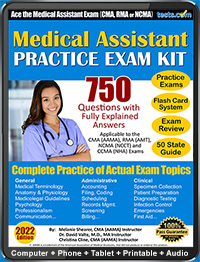 For more information, see Tests.com's Medical Technician's Test Guide. Medical technicians and technologists play an important role in health care. From taking x-rays to examining blood, med techs assist doctors and nurses in diagnosing and treating patients and in providing overall patient care. Medical tech positions include those in sonography, respiratory therapy, medical assisting, asthma education, physician assistant, phlebotomy and radiography. All of these positions have options for certification; some are voluntary while others are required for state licensure. To learn more about certification as a Medial Tech, see our Medical Technician Test Guide.